The dashboard/overview is meant to be your statistical lookout point that you will see every time you login. This helps you keep track of the activity of your campaigns and a monthly/daily/hourly basis. Having this as the first page every time you login keeps you constantly aware of the performance of your marketing outreach. 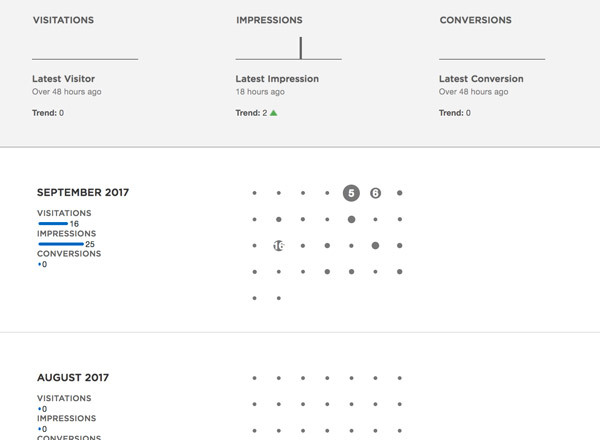 At the top in gray, under visitations, impressions and conversions, you have an hourly bar graph which relatively represents the amount of hits and conversions your popup is receiving. Each bar of the graph is one hour and it spans 48 hours wide so that you can compare the last 24 hours against the previous last 24 hours. The trend listed below the graph is calculated by subtracting all the hits from last 24 from against the hits in the previous 24 hour period. This provides you an idea of how well things are doing today compared to yesterday. We made this feature because at times when these graphs get really full of data it becomes too hard to compare yesterday to the previous day with your eyes just looking at a graph. Below the gray area you have 3 months broken down for you into two columns. In the first column you have the total for that month. In the second column you have a relative circle graph representing every day in the month. Each dot represents a day, when a day has relatively more activity than what has been analyzed as an average day, the dot begins to grow. There are times you may see dots that were big, begin to shrink. This is caused by the fact that if more recent days begin to change the average day. When the average day is changed there is an new higher standard created for what makes a dots mass, therefore it can cause it to shrink. This allows us to analyze a the days going by with a heat-map graph.